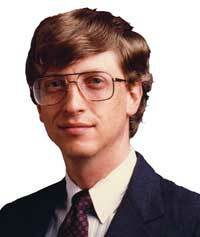 Portrait of the mogul as a young man: Bill Gates before the billions. GCN marks its 25th anniversary this year (it debuted in 1982, when Time magazine named the computer its Man of the Year), and we will devote a little space in each issue to some of the significant IT developments of the past quarter-century. 'Bill Gates, Microsoft Corp. founder, at a joint meeting of the Integrated Software Federal Users Group and the Capital PC Users Group in Washington. The Intel 80386 processor gave Intel dominance in the chip market and gave rise to the PC clone industry. In fact, the chip is still being produced, though only for embedded systems. Intel has announced it plans to discontinue production in September. "I think it's such a powerful distribution medium ' it really is ' that the word 'distribution' should almost be equated with CD-ROM."